Given by the artist to prominent art critic Clement Greenberg, Gift exemplifies Greenberg’s taste for high modernist abstraction. This In Focus offers a new reading of the painting in relation to the social and cultural mores of 1960s America, from the cold war space race to popular psychology. 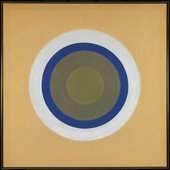 Kenneth Noland’s Gift 1961–2 is a six-foot square abstract painting of concentric rings centred on a subtly tinted background. Produced near the end of Noland’s series of circle paintings of 1958–62, the work was originally entitled Clement’s Gift – a reference to it being given to Noland’s friend and long-time supporter, the influential New York art critic Clement Greenberg. Greenberg mainly understood Noland’s art according to its formal properties, but this In Focus project uses the critic’s ownership of Gift to explore how questions about taste and tastefulness coloured its reception. It also considers the artist’s richly suggestive claim to be a ‘one-shot painter’ and his enthusiasm for the controversial therapeutic techniques of psychiatrist Wilhelm Reich in order to locate the work within the broader domains of American culture that shaped its meanings. Published in May 2017, the project is authored by Alex Taylor (University of Pittsburgh) and includes a contribution from Mollie R. Berger (National Gallery of Art, Washington, D.C.).